After getting my off-road fix, I got a chance to sit down and relax in the shade with a cool beverage and have a great, in-depth conversation with our good friend Evan Fulton. Many of you may remember Evan from the exclusive Nissan Pathfinder live chat we held several months ago. As the Product Planning Specialist for Pathfinder, Xterra and Frontier, we had a lot to chat about. He’s especially proud of the reception that the Pathfinder has received, and spoke excitedly about the new Pathfinder Hybrid, and the future of the Xterra and the Frontier. I learned a great deal about the due diligence that goes into readying a new vehicle for production, and while we may think that change occurs at a glacial pace, there are actually countless processes that happen behind the scenes. For fun, I gave him a theoretical situation – Let’s say consumers said they wanted to see the LP200 (the little diesel-powered 2-seater ute we drove yesterday) He gave a really thorough example of the decision tree, backed up by statistics, financial considerations, regulatory restrictions, and other hurdles that all have to be cleared in order to even consider bringing a new vehicle to market. In consideration of all this, it’s a wonder anything remotely “cool” (to an enthusiast) ever makes it to showrooms! I really appreciated Evan’s engagement and patience with all my questions – We’ll be talking to him some more in the future! I regret to mention that I didn’t get a chance to experience the Nissan Autonomous Car demonstration. 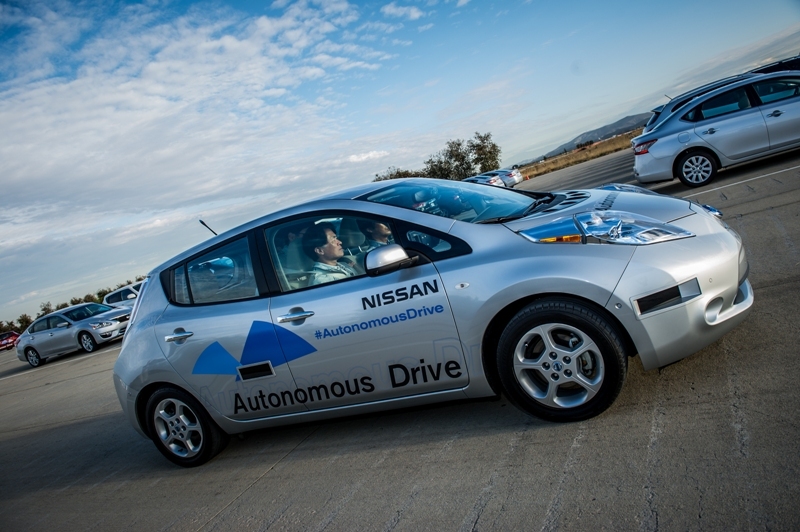 Journalists at Nissan360 were among the first non-employees to experience Nissan’s Autonomous Drive technology in a specially-constructed Nissan Leaf. Equipped with laser scanners, Around-View Monitor cameras, as well as advanced artificial intelligence and actuators, this technology enables the car to negotiate complex real-world driving scenarios, without any driver intervention. Here’s a cool video of the Autonomous Drive Nissan LEAF demonstrations (the automated parking commands via smart phone are pretty awesome)! 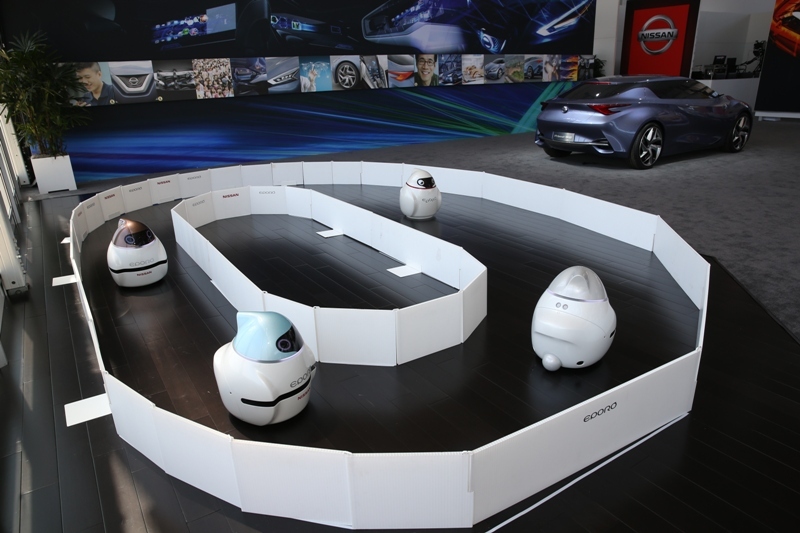 I almost forgot to mention, along this same subject – Within the Nissan360 headquarters, visitors could watch a demonstration of the EPORO robot technology. Created in 2009 by Nissan engineer Susumu Fujita, the EPOROs are small, zero-emission robots that could change the way we get around forever by eliminating collisions and creating an environmentally friendly and traffic-jam free driving environment. The EPOROs behave like fish, moving together in schools, in streams, and avoiding obstacles. The technology in the robots has already been a source of inspiration for current Nissan vehicle features like intelligent brake assist and forward collision warning.